Last week on Doctor Who, a life or death struggle between Earth and the Moon played out, with the first part winning out and the second not really being too much of a factor. The adventure caused a gigantic rift between The Doctor and Clara, which ultimately inspired the companion to take her leave for what seemed to be forever. Surprisingly enough, this week's episode has a couple of developments that fans weren't expecting when it came to the relationship between The Doctor and his extremely upset companion. So out of nowhere, Clara was back this week. After a scene of dialogue that didn't last as long as it should have, we were pretty much expected to think that Clara would be back that easily. Depending on your threshold for such things, this was either really annoying, totally expected, or completely acceptable: pick two at your leisure. Besides that one stumbling block, Clara continues to be well written and a very useful companion, and perhaps that's why she's coming back. The Doctor, on the other hand, does not miss a beat with this week's episode. He's especially interesting as he interacts with the various experts on the train, and the train was literally full of them. Watching The Doctor play detective is always fun, but to see him play detective in more of the traditional vein of the role is even more exciting. After all, this is a take on a rather famous Poirot mystery written by Agatha Christie. Capaldi's Doctor seems much more balanced this week, and we're all the more rewarded for it. Another twist in the plot is that the Mummy (known as “The Foretold”) in the title isn't really the baddie, but instead an artificial intelligence named Gus. A rather evil computer that wants to harness The Foretold's power for some strange reason, he's not afraid of decompress a compartment full of people to keep The Doctor in line. Of course, if you're trying to outfox The Doctor, you'd have had to gotten up at the beginning of Time, and even then you'd be too late. In true Doctor form though, this week's puzzle was solved with frantic pacing and a depth of understanding so often lacking from similar situations. It took a Doctor to realize that The Foretold wasn't a monster, just a soldier waiting to be relieved of duty. And then, of course, the elephant in the room rears its head again. That elephant being Clara and Danny's relationship versus Clara's traveling days with The Doctor. Danny seems to be of the mind that Clara is saying goodbye and taking her leave after this “last hurrah,” and The Doctor seems to be thinking that way too. But what type of show would this be if Clara were to leave that easily? Of course, this week's ending is kind of interesting, considering we saw the train explode with everyone on it. Everyone, including The Doctor and Clara. Yet we're to believe that by the end of the episode, everyone is hunky dory. Doesn't this look a little too perfect? Is this the truth, or is someone lying to us? And is Clara and Danny's relationship going to survive her lying about his acceptance of her continued adventures? Maybe we'll find out next week, as The Doctor and Clara are separated, leaving the companion to be the hero in what looks like a return to the Doctor lite episode format. Join us next Saturday, as we recap “Flatline!” In the meantime, you can head on over to page 2 for this week's Doctor's Notes, which has the honor of being the longest list of notes this season! They're really playing up the soldier aspect this season, as there's been a lot of reference to PTSD, as well as soldier characters being peppered throughout the season. Maybe The Doctor is becoming more sympathetic to soldiers, instead of hating them on contact, as seen with The Foretold this week. I really enjoyed how they actually ran a clock on the bottom of the screen whenever there was a mummy attack. It's fun, it's out of the ordinary, and it fits the story. Were the experts supposed to be various minds from the ages? The one guy looked very much like an Einstein clone, so it kinda makes sense. Two big references this week, the first being that this whole episode is reminiscent of something Eleven said in The Big Bang. 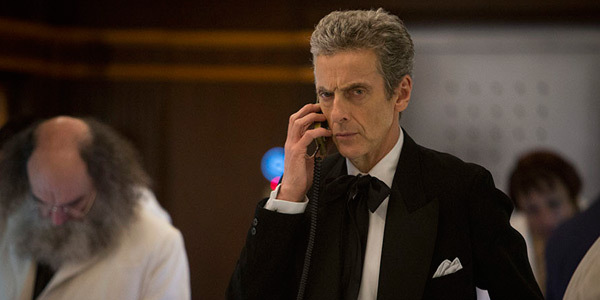 Apparently, the phone call from Gus in his past turns out to be the call he got the night of Amy and Rory's wedding. Though I don't think it's been four thousand years. The second big reference is another Tom Baker era reference, as The Doctor carries a cigarette case full of Jelly Babies. Is it just me, or did the scene where The Doctor had his little debate with himself in his room include a split second of Benedict Cumberbatch's Sherlock voice? I'm still kind of weirded out that Clara came back so easily (at least, story wise) when she was that upset at the end of last week's episode. She was seriously disturbed by The Doctor's methodology last week, and he looked like he was playing a similar strategy this week. Is Clara really that addicted to the adventure, or is she just mad? I really wish this was a solo Doctor adventure, because the way he interacted with the other experts on the train seemed to make more sense than the really quick patch job between him and Clara. I wonder what would have happened if The Mummy tried to drain The Doctor? Would it have triggered a regeneration, or would it have drained him until he died for good? What is this thing's power limitations? Why did Gus want to reverse engineer the Mummy's powers? Is he working for Missy? Not only is it funny that Clara has a Samsung product (seeing as they're sponsors of the BBC America telecasts,) her phone is of the Galaxy model. Product placement works best when it's slyly funny as such, though if she really wants to talk to The Doctor, she should be on the Phone screen, not the main menu with the Apps icon clearly displayed. I really want to see The Doctor pal around with a male companion again, leaving the quasi romantic mentality in the dust and just giving him a Watson to play off of his Sherlock. Or he could go it alone, and much like the Specials Collection that ended David Tenant's era, he could adopt a new companion each adventure.